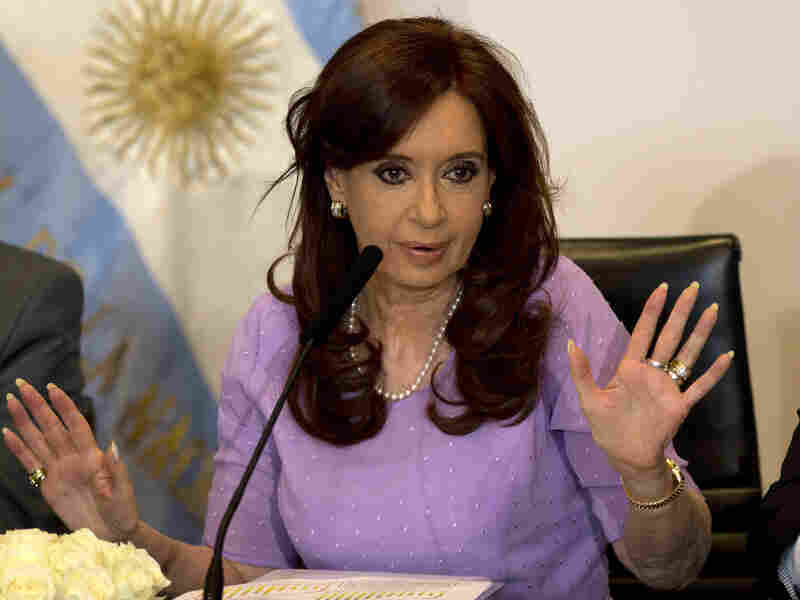 Judge Throws Out Cover-Up Allegations Against Argentine President : The Two-Way The judge ruled prosecutors' claims against President Cristina Fernandez de Kirchner failed to meet standards for an investigation. She was accused of covering up Iran's alleged role in a bombing. A federal judge on Thursday dismissed allegations by prosecutors that Argentine President Cristina Fernandez de Kirchner, seen here Feb. 11, tried to cover up the alleged involvement of Iranian officials in the 1994 bombing of a Jewish center in Buenos Aires. Last month, an Argentine prosecutor who was due to testify about an alleged cover-up in the investigation into the deadly 1994 bombing of a Jewish center in Buenos Aires was found dead. Alberto Nisman had accused President Cristina Fernandez de Kirchner's government of covering up Iran's alleged role in the bombing that killed 85 people to push through a grains-for-oil deal with Tehran. After Nisman's death, the investigation was continued by prosecutor Gerardo Pollicita. Thursday, a judge dismissed the accusations, saying the documents filed by prosecutors had failed to meet the minimum standards for a formal investigation. Kirchner had previously dismissed the allegation of a secret deal with Tehran as "absurd." Nisman was found dead in his apartment last month with a gunshot wound to the head. A prosecutor said there appeared to be no outside involvement in the death, but investigators were treating it as suspicious. Kirchner waded in, saying Nisman's death "was not a suicide," sparking conspiracy theories in the country over his death and his investigation. She then dissolved the country's intelligence agency, suggesting it was tied to Nisman's death and saying it "has not served the national interests." "Part of this fascination has to do with Argentina's murky, bloody history. The country suffered a brutal dictatorship under which people disappeared and babies were stolen to be brought up by their parents' torturers. Conspiracy theories in Argentina often turn out to be true." Thursday, the country's Congress also approved a law overhauling the intelligence agency, replacing it with a new intelligence service. Reuters adds: "The Chamber of Deputies voted 131-71 to create the Federal Intelligence Agency. The government says it will be structured to improve the accountability of espionage agents compared with the soon-to-be dismantled SI Intelligence Secretariat."